Hannah Lyman, Vassar's first Lady Principal, was born January 29, 1816 in Northampton, Massachusetts. After completing her education in Northampton and Ipswich, she taught at Gorham Academy in Maine and Mrs. Gray's Seminary and served as principal of another girls' school in Montreal. In June 1865 the Board of Trustees unanimously elected Miss Lyman as the college's first Lady Principal. During her service she struggled to reconcile traditional expectations regarding the supervision of young women with the progressive aims of America's first women's college. Mary W. Whitney, class of 1868, called Miss Lyman "A lady of the old school stepping across the threshold of the new era! . . . She understood that Vassar College was to be of a different order from the girls' seminary, and she sympathized fully with its aim for a broader education. But the basis of habit is stronger than the instigation of reason. The understanding acknowledges the premise a long time before feeling approves the conclusion." Miss Lyman struggled to foster students' independence and ambition without sacrificing Victorian standards and expectations of privileged young women. The problem, according to Miss Lyman, is how "to allow of the freest possible individual development, yet at the same time to exercise the control needed for the good of all." Many of the Vassar students, especially the older ones, found Miss Lyman's "ultra-conservative Victorianism" too restrictive and narrow. Anna Howes Barus attended Vassar after hearing from a friend that "The girls at Vassar have as much fun as the boys at Harvard." She was disappointed to learn that under Miss Lyman's supervision this was hardly the case. One morning after Chapel service Miss Barus ran down the third-floor corridor of Main to catch up with her cousin when Miss Lyman caught the young lady from Massachusetts by the shoulder and warned her, "for the honor of the old Bay State never run again." Miss Barus remembers that, "Having played hop-scotch on the sidewalks in Boston, and baseball and prisoner's base, with the children of the neighborhood, my ideas of Massachusetts honor received a sudden jolt." Miss Lyman's strict dress codes were notorious. She abhorred extravagant attire and wrote letters home to students' parents requesting that they encourage their daughters to "Lay aside expensive trimmings" and "Bring only very few dresses." She concluded, "Our growing conviction is that Christian principle, through intellectual culture, will in time so elevate our young country-women, that dress, like all else belonging to them, shall be marked by that delicate taste, good judgment and conscientiousness, which denote true self-respect." Students' reactions to the lady principal were complex. In The Golden Age of Vassar, Mary Harriett Norris writes of Miss Lyman, "Many a girl at once feared her to the limit, resisted her with petulant dislike, and adored from afar the elegance, the majesty of Vassar's first and unique Lady Principal." Above all Miss Lyman engendered respect. One Halloween the Lady Principal spoke to the Vassar students warning them that Halloween was a custom only celebrated by their social inferiors and that anyone staying out past curfew would be swiftly punished. The next morning at chapel Miss Lyman requested that "All of the young ladies out of bed past ten o'clock last night will come to my office at seven o'clock this evening." As the hour approached, the corridors became crowded with students proceeding to their appointment with the Lady Principal. When Miss Lyman opened her library door at seven she was shocked to find the majority of the students before her office and had to order them to withdraw to the chapel where she would speak to them collectively. During the last years of her service Miss Lyman began to relax as a disciplinarian. When Vassar first opened, students had to submit all of their letters for Miss Lyman's approval before mailing them, but as the institution matured, students began to enjoy the greater freedoms and responsibilities characteristic of true college life. Whitney wrote that "During that five years of her official position at Vassar, Miss Lyman changed quite materially her point of view. She grew perceptibly into the spirit of the larger freedom, and when a mind over fifty years of age thus grows out of the bias of the past and admits the broader outlook which must shatter many closely held prejudices, we cannot but perceive in this the test of a natural greatness of heart." 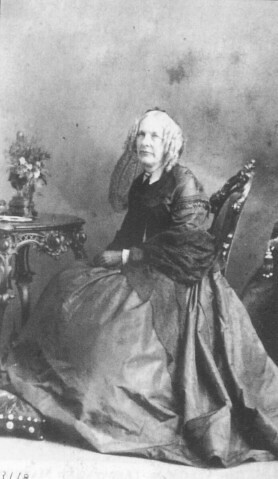 Miss Lyman remained devoted to her service as Lady Principal of Vassar until her death. Mary W. Whitney wrote, "When, in 1871, she lay upon her death bed almost too feeble to speak, her mind was still busy with the needs and hopes of the college." After her death The Miscellany remembered her for both her piety and her progressivism: "Reverently believing herself an instrument in God's hand, her work was to elevate the standard of Christian womanhood, to bring women out from the narrow limits of frivolity to the broad basis of truth and noble purpose, to make Vassar College the exponent not only of higher literary education but also of moral and religious culture." Cornelia Raymond, Biography Note Cards: Faculty and Trustees, "Hannah Lyman." Vassar College Special Collections (VCSC). Annie Howes Barus, "Vassar, Fifty-Five Years Ago," Vassar Quarterly (August 1924): 237-8. Hannah Lyman, Archives Collection, "Lady Principal - Correspondence" Box3, Folder 78, VCSC. Mary Harriott Norris, The Golden Age of Vassar (Poughkeepsie: Vassar College, 1915), 25, 27, 42.